How do I grow the “likes” on my Facebook business page? If I had a dime for every time I get asked this question……well, I’d have enough money to buy lunch, anyway. As Facebook business pages mature, and marketers are getting more savvy at building up followers, there are some shinning examples rising to the top. The most dramatic local example which made national news is of a Goodlettesville, Tennessee chiropractor and the Mega Millions Lottery Jackpot. I was browsing Facebook one day when I came across a “shared” post by one of my friends who lives in Nashville. The post said, “I am already winning” and included a shared photo of a lottery ticket from Goodlettesville Chiropractor. I didn’t initially think anything of it since that was the day of the Mega Millions drawing for the $640 million jackpot and lots of people were posting about their winning numbers. It wasn’t until I scrolled down my Facebook news feed and saw several of my out-of-town friends had also shared the same photo from our local chiropractor with the post “I am already winning” that I really got curious, and JEALOUS. Jealous because, once I clicked through to the chiropractor’s page I realized I was witnessing one of the most clever Facebook campaigns I had ever seen and I wished I would have thought of it. This chiropractor bought a lottery ticket and posted a picture of it on his page with the following instructions, “Share this photo on your page with the caption, ‘I am already winning’, and I will split the winning ticket with you”. According to this write-up in the Nashville Business Journal, the photo was posted around 6pm on March 29th and by lunch time on March 30th had 18,758 shares and 13,585 new likes on his Facebook page. It seems the final results were up around 90,000 likes, but Facebook intervened and removed thousands of the “shares” and “posts”. It may have violated some type of Facebook guidelines, although I don’t know which ones. When you have a page grow that fast, it is bound to get Facebook’s attention. According to the Goodlettsville Chiropractor Facebook page, the current tally of fans is 25,168. Did I mention that he started with 28 fans? I’d call that a successful campaign. Well, now how about a couple of ideas you can implement to grow your own Facebook Fan Page? If you are purchasing advertising with local TV, radio, or print it’s probably correct to assume that they are directing their viewers, listeners or readers to “like” their Facebook pages. Most of these media outlets have tens of thousands of “likes”on their pages. The really smart media outlets are starting to put together promotions to leverage these thousands of likes and make them available to their advertisers. We just ran a contest with WTVF- News Channel 5 and one of our clients where we gave away an iPad. News Channel 5 promoted the giveaway during their 3 news casts directing viewers to their Facebook Page to enter to win. 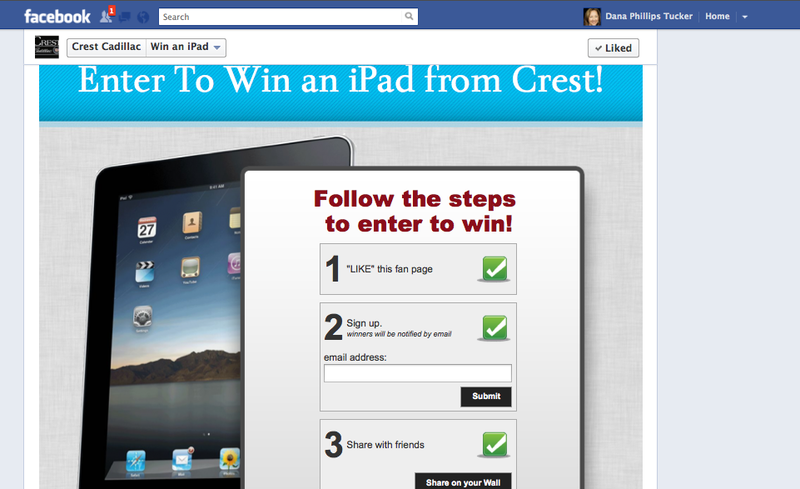 Once viewers entered their contest, they were directed to our client’s Facebook page for a chance to win another iPad. This one day contest resulted in over 5200 new “likes” for our client. We did have to pay for the promotion, but it was well worth the investment to the client to have that kind of explosive growth for their Facebook pages. It’s not often in your marketing career that you get to see an increase in “weekly total reach” like this in just one day. A third option for growing your Facebook fan base is to run Facebook ads. You can set your maximum daily budget and narrow your target audience very specifically. We recently helped a client grow their “likes” by 1000 people over a weekend with a VERY specific target group and they only spent $100. This is a great option for most small business owners who do not have deep marketing budgets. If you need help growing your Facebook “likes” we would love to talk to you. If you are Dr. Lee Bullington of Goodlettsville Chiropractic and you need PR representation with your new found Facebook fame, we’d love to talk to you too. You can contact us HERE. « Facebook Timeline: Embrace The Change! Great post! Now you’ve got me interested . . . Thanks Ann! I appreciate you stopping by.